(10 a.m. EDT) -- French America Line, the newest cruise line to offer sailings on the Mississippi River and other American waterways, has delayed its launch for a few weeks. The line's sole ship, Louisiane, was expected to make its maiden sailing on October 1. That has been delayed to October 18 because of issues with getting work done in the extreme rains that hit Louisiana earlier this summer, a spokesperson said. Passengers who were set to go on the first few sailings have received the following options for compensation: Rebooking on any 2016 cruise at 50 percent off the canceled fare with the company paying the airline change fees and any advance purchases; or rebooking in 2017 at a 25 percent discount with the airline fee change or cancel outright with a $250 per person credit and reimbursement of air. The first three sailings of Louisiane are slated to be charters, so November 9 is the first cruise that will be carrying regular passengers. That cruise will run round trip from Nashville. French America Line announced it would be arriving on the rivers earlier this year. The line's founder, Christopher Kyte, planned to make Louisiane French themed and upscale, with macarons and chocolates from Parisian providers and French cuisine in the ship's two restaurants. Fares include a night in a luxury hotel, all alcoholic beverages, a daily shore excursion, bikes onboard, room service, bottled water and Wi-Fi. Itineraries are intended to be shorter and on lesser-traveled rivers, such the Red, Tennessee and Cumberland Rivers. Mississippi River cruises are becoming more popular, particularly in a year where traveling to Europe seemed dicey to some people. American Cruise Lines added a second paddlewheel, America, to its Mississippi River fleet early this year. 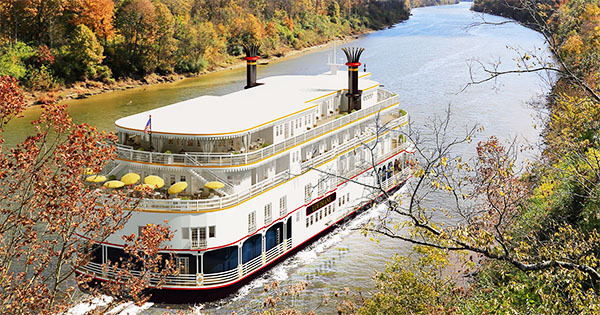 And American Queen Steamboat Company said recently that their sailings on American Queen were running at 95 percent capacity; the line is adding a new ship, 166-passenger American Duchess, on the river in 2017.